on 6 of the 8 internal disks of the Sun Fire 4150.
for JMS logs to ensure durability for the JMS messages. The 80 minute run for this submission required less than 10GB of database storage. This extrapolates to less than 180GB for a 24 hour period. The SunFire 4150 is configured with 219 GB of Raid 1 storage. Sun GlassFish Enterprise Server v2 Update 2 uses pass-by-value semantics by default. 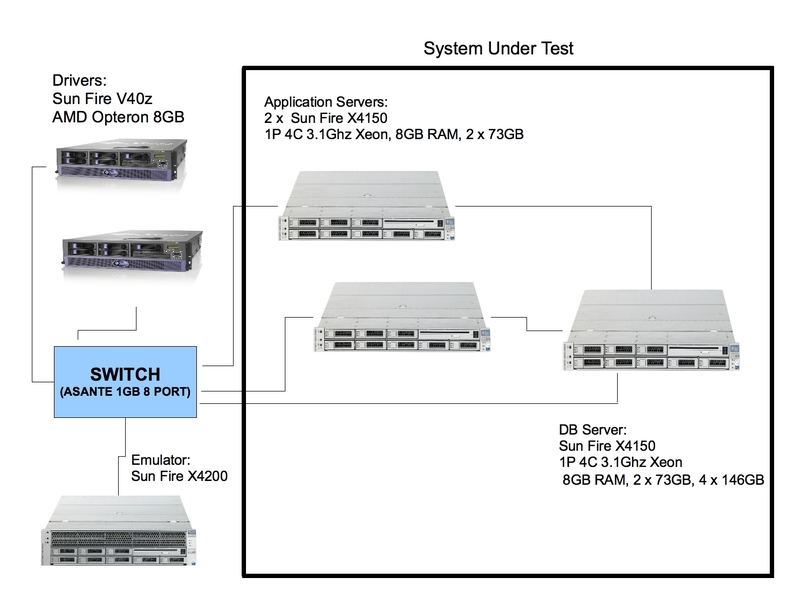 meet the storage requirements for the Raid 1 DB stripe. This substitution is performance neutral. with the Sun GlassFish Enterprise Server v2 Update 2.
flushes modified database pages from the buffer pool in batches.